The Asian cockroach was identified as a newly introduced species to the United States in 1986 when a professional pest control operator collected these insects in Lakeland, Florida. He referred to them as German cockroaches, Blattella germanica (L.), but noted that their behavior was unlike any other German cockroaches that he had previously encountered. Upon further investigation the cockroaches were found to be Blattella asahinai, Asian cockroaches. Figure 1. Adult female Asian cockroach, Blattella asahinai Mizukubo, carrying an egg case (ootheca). Photograph by R.W. Baldwin, University of Florida. The Asian cockroach was first described in 1981 from insects collected on Okinawa Island, Japan. Blattella asahinai was most likely introduced into the United States through imports from Japan. Since the first identification of Blattella asahinai in Lakeland (Polk County), it has spread through much of Florida and is reported in Alabama, Georgia, South Carolina and Texas. The primary habitat of the Asian cockroach is outdoors in shaded mulched or composted areas, such as landscaping and gardens, where fresh plant litter accumulates. Populations of 30,000 to 250,000 insects per acre have been reported. Members of this species are strong fliers, unlike their close relative, the German cockroach. They may invade structures but indoor infestations are rare occurrences. They become active at sundown and are attracted to light-colored surfaces and brightly lit areas. Adults will take flight during the day if disturbed. In 2008, the USDA published reports that the Asian cockroach might also have a possible beneficial role, as an egg predator, in controlling lepidopteran pests of annual crops (USDA 2008). However, as it is primarily a pest, there are no plans to distribute it as a biological control. Asian cockroaches are almost identical to German cockroaches. Chemical analysis by gas chromatography will confirm the species. However, there are also slight morphological differences between Blattella asahinai and Blattella germanica. Asian cockroach adults have longer and narrower wings than those of German cockroaches. Figure 2. Adult male Asian (left), Blattella asahinai Mizukubo, and German (right), Blattella germanica (Linnaeus), cockroaches, ventral view. Notice the wings of the Asian cockroach extend past the tip of the abdomen. Photograph by Dina L. Richman, University of Florida. There are also differences between the species in the shape of the male tergal glands. Asian cockroach females produce smaller egg capsules and nymphs are smaller than those of German cockroaches. Asian cockroach first instars have 23 antennal segments while German cockroach first instars have 24 to 25. Finally, margins of the abdomen and spots along the abdominal midsection of late instars of Blattella asahinai appear white, whereas those areas are lightly pigmented in Blattella germanica. Figure 3. Ventral view of late stages of gravid female Asian cockroach (left), Blattella asahinai Mizukubo, and gravid female German cockroach (right), Blattella germanica (Linnaeus). 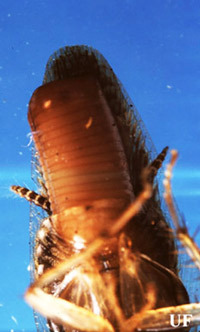 Notice that the ootheca of the female Asian cockroach does not extrude as far beyond the adult's wings as the ootheca of the female German cockroach. Photograph by Dina L. Richman, University of Florida. Figure 4. The ootheca of a female Asian cockroach (left), Blattella asahinai Mizukubo, does not extrude as far beyond the adult's wings as the ootheca of a female German cockroach (right), Blattella germanica (Linnaeus). Photograph by Dina L. Richman, University of Florida. Figure 5. Early instar German (left), Blattella germanica (Linnaeus), Asian (right), Blattella asahinai Mizukubo, cockroaches, dorsal view. Photograph by Dina L. Richman, University of Florida. Figure 6. Late instar German (left), Blattella germanica (Linnaeus), and Asian (right), Blattella asahinai Mizukubo, cockroaches, dorsal view. Spots along the midsection of the Asian cockroach appear white, while those areas are lightly pigmented in the German cockroach. Asian cockroach nymphs are also smaller than German cockroach nymphs. Photograph by Dina L. Richman, University of Florida. Figure 7. Adult male German (left), Blattella germanica (Linnaeus), Asian (right), Blattella asahinai Mizukubo, cockroaches, dorsal view. The pronotal stripes of the Asian cockroach are darker and more defined compared to the stripes on the German cockroach. Photograph by Dina L. Richman, University of Florida. A female Asian cockroach produces approximately four egg capsules (oothecae), each averaging 37 eggs, in her lifetime. Nymphs take approximately 67 days to reach adulthood. Adult females live an average of 104 days and adult males live an average of 49 days. Adult females produce their first egg capsule 13 days after eclosion, and can produce another 20 days later. Adults are abundant February through May and again August through September. Nymphs predominate May through August. Figure 8. 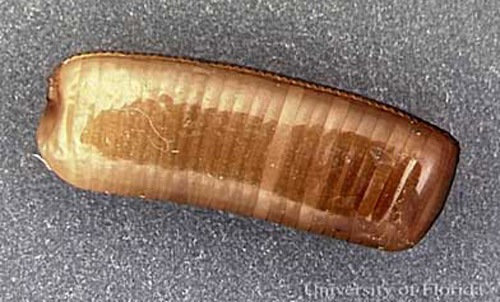 Egg case (ootheca) of the Asian cockorach, Blattella asahinai Mizukubo. Photograph by R.W. Baldwin, University of Florida. Control of Asian cockroaches is difficult due to their mobility and adaptability to various habitats. Traditional treatments using residual sprays inside and around the perimeter of a structure are ineffective due to infestations in mulched and wooded areas. Plus, adults enter homes through windows and doorways, avoiding areas typically treated for control of German cockroaches. Sodium vapor lamps for security lighting and yellow incandescent bulbs for porch lighting are both less attractive to adults and reduce attraction of adult insects to lighting near buildings. 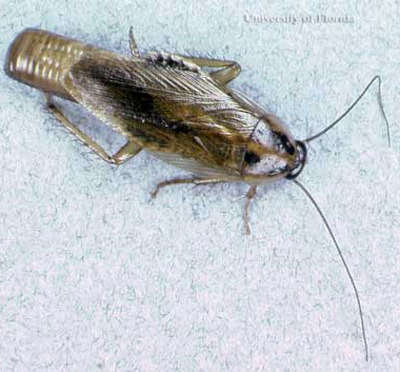 Although Asian cockroaches are susceptible to many pesticides, toxic pelletized baits scattered outdoors have provided the most reliable control. Appel AG. 1997. Nonchemical approaches to cockroach control. Journal of Economic Entomology 14: 271-280. Atkinson TH, Koehler PG, Patterson RS. 1991. Reproduction and development of Blattella asahinai (Dictyoptera: Blattellidae). Journal of Economic Entomology 84: 1251-1256. Brenner RJ, Patterson RS, Koehler PG. 1988. Ecology, behavior, and distribution of Blattella asahinai (Orthoptera: Blattellidae) in central Florida. Annals of the Entomological Society of America 81: 432-436. Ross MH, Mullins DE. 1988. Nymphal and oothecal comparisons of Blattella asahinai and Blattella germanica (Dictyoptera: Blattellidae). Journal of Economic Entomology 81: 1645-1647. Roth LM. 1987. Blattella asahinai introduced into Florida (Blatteria: Blattellidae). Psyche 93: 371-374. Publication Date: January 2000. Latest revision: June 2014. Reviewed: April 2017.